A tanker fire that closed the N2 near Sarnia in Durban yesterday morning proved the undoing of two car thieves whose escape was foiled by gridlock traffic. The two men were caught, while sitting in a stolen Toyota Hilux, by tracking company officers who had happened upon the signal emitted by the vehicle. Being placed in handcuffs was especially bitter for one of the men, who is understood to have been recently been released from prison after he was convicted for the theft of another Toyota Hilux. See photos from the scene yesterday by clicking here. ProForce Security’s Jeremy Berry said he had joined the queue of traffic on the N2 from the M7 Edwin Swales Drive when he, accompanied by another tracking officer, had picked up a signal from a stolen car. “The freeway was already jammed with traffic because it had been closed when the two tankers caught fire. Myself and Pieter Loubscher from Tracker got a weak signal from a bakkie that had been taken in Pietermaritzburg and we started to follow the trail,” he said. Berry has added that as they travelled towards the accident scene, the signal emitting from the bakkie got stronger. Berry says that the driver and passenger were detained and it was confirmed that the bakkie had been stolen from Pietermaritzburg just hours before. “We believe that one of the men we arrested had previously been convicted for stealing a Hilux and had only been on the outside for a couple of months. "It was a good success for us and all because of the massive traffic jam from the fire. 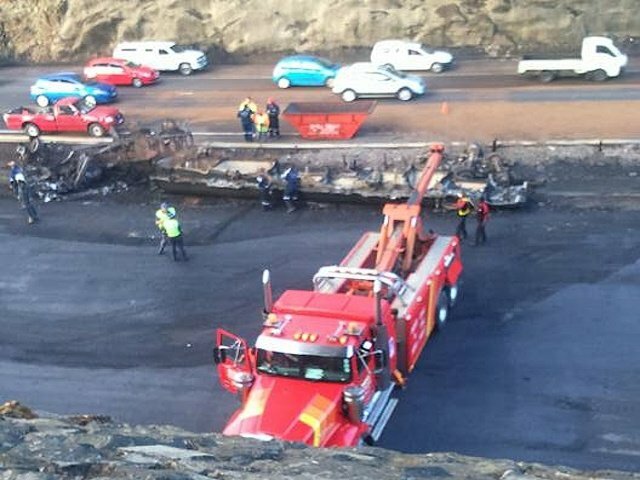 Main routes across Durban were blocked yesterday, a ripple effect of the freeway closure caused by a fire which broke-out after two fuel tankers collided. Police were not available for comment at the time of publishing.